The corneal thickness is one of the factors having influence on the tonometrical values. Keratoconus usually evolutes with decrease of corneal thickness and, as a consequence, the tonometrical values may underestimate the real intraocular pressure. The transpalpebral tonometer diaton surges as an equipment that may not be influenced by the corneal thickness and obtain tonometrical values closer to the real intraocular pressure. Compare intraocular pressure values acquired by three different tonometers (Goldmann,Tonopen and transpalpebral diaton tonometer) in patients in two groups: control group and keratoconus patients. And evaluate the influence of corneal thickness on each tonometer. Patients were divided into two groups: the control group, with patients without keratoconus or corneal thinning, and the keratoconus group, with patient with keratoconus or corneal thinning. 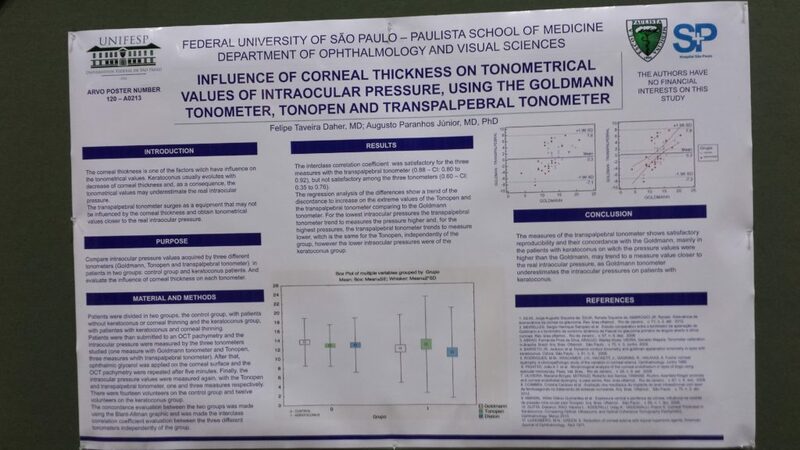 Patients were than submitted to an OCT pachymetry and the intraocular pressure were measured by three tonometers under the study (one measure with Goldmann tonometer and Tonopen, three measures with transpalpebral tonometer). After that, ophthalmic glycerol was applied on the corneal surface and the OCT pachymetry were repeated after five minutes. Finally, the intraocular pressure values were measured again, with the Tonopen and transpalpebral tonometer, one and three retrospectively. There were fourteen volunteers on the control group and twelve volunteers on the keratoconus group. The concordance evaluation between the two groups was made using the Blant-Altman graphic and the interclass correlation coefficient evaluation between three different tonometers independently of the group was made. The interclass correlation coefficient was satisfactory for the three measures with the transpalpebral tonometer (0.88- CI: 0.80 to 0.92), but not satisfactory among the three tonometers (0.60 – CI: 0.35 to 0.76). The regression analysis of the differences shows a trend of the discordance on the extreme values of the Tonopen and the transpalpebral tonometer comparing to the Goldmann tonometer. For the lowest intraocular pressures the transpalpebral tonometer trends to measure the pressure higher and, for the highest pressures, the transpalpebral tonometer trends to measure lower, which is the same for Tonopen, independently of the group, however the lower intraocular pressure were of the keratoconus group. The measures of the transpalpebral tonometer show satisfactory reproducibility and their concordance with the Goldmann, mainly in the patients with keratokonus on which the pressure values were higher than the Goldmann, may trend to measure a value closer to the real intraocular pressure, as the Goldmann tonometer underestimates the intraocular pressure on patients with keratoconus.